Shikoto Hand Forged Katana Damascus Sword | BUDK.com - Knives & Swords At The Lowest Prices! United Cutlery continues its proud legacy of top-quality edged collectibles with this breathtaking Yoru Doragon Damascus steel katana sword. 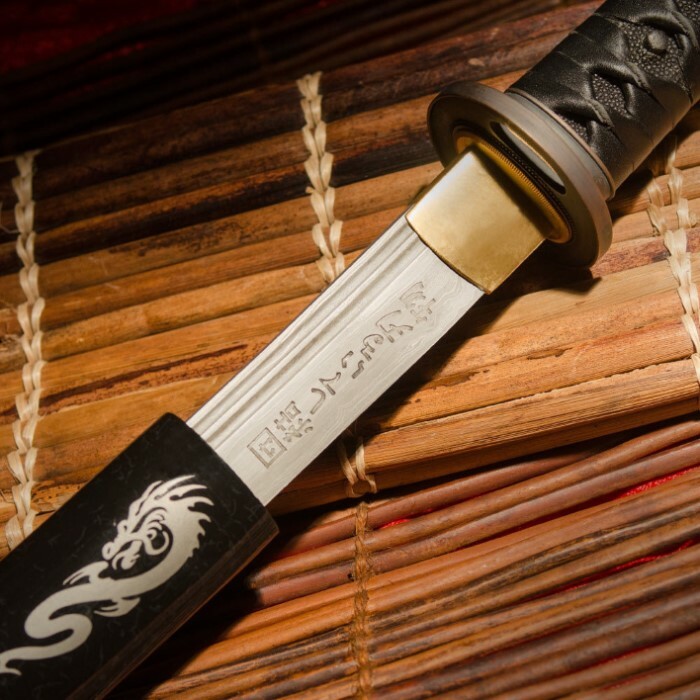 Crafted with supreme Samurai style, each katana features striking heat-forged Damascus steel blades that offer 1792 layers of superior power and strength, as evidenced by the handsome laser etchings. The translation of the etchings means "United Strong Steel." Ive bought many swords from this catalog, And they may not be 300 year old swords from the heyday of sword manufacture in Japan, BUT For the price, these modern swords are actually made of much better steel, the old masters could only dream of. Swords are not meant to chop through 4 inch pieces of wood, they were made for cutting flesh. Try a watermelon. As a machinist for 40 years, I know good steel when I see it, Swords were never meant to be so Hardened and tempered that they break on impact. Also, as the brother of the chief Medical Examiner in San Francisco. I can tell you that people are not made of wood. If you want to chop a tree down, Use an ax, chainsaw, or hatchet. Swords are not meant for that kind of cutting. Judging from all the reviews I'm not sure if I just got one of the few bad ones of the batch or nobody else used the sword to test its abilities. First off, the good. It is an extremely light sword, in fact shockingly so. The craftsmanship, for the most part, is adequate. The real leather was especially appreciated. Now to the reasons I gave this 2 starts. For some background, I'm a mechanical engineer and know a thing or two about metals, their properties and hold a fascination with Japanese forging techniques. : 1.Plastic pegs which hold the tang holes. (My biggest gripe from most full tang Chinese made swords) 2. There was no distinct Hamon Temper line. 3. There were a few pit marks on the tip of the blade with rusting. This either means it is in fact made from 1060 CARBON STEEL or rust. (Seriously the description says Damascus steel with a 1060 notation which clearly denotes SAE Carbon Steel) 4. This is not battle ready and my biggest reason for not liking this blade. Perhaps I had my hopes set to high and overestimated the strength 1060 in a sword. Maybe I shouldn't have slashed at that 4 inch diameter DEAD tree branch. It cut through it after 4 hits but it bent the blade. Yes that's right, bent it in two places, not only along the edge but also bent the entire blade along the length so it does not fit back into the sheath all the way. Conclusion: Yes it is sharp, extremely sharp. it's a fair sword. but is not the battle ready blade I had hoped for. Bought this after I got the Yoru Doragon Tanto. The pattern welded steel is very nice. The blade is heavy but nicely balanced. I love the simple yet elegant style of this set so the waki is on order too. This blade needed some maintenance when it arrived. The blade was dry and beginning to develop signs of rust. I cleaned it with Frog Lube and reapplied a week later and its in fine shape. It still had a wire edge from final buff so I honed the edge making it razor sharp. The tsuba was loose so had to do some shimming to tighten it up. After the tune up it was fit to fight. If you don't mind investing a little time maintaining this blade then it is worth the investment. A work of Art and a thing of Beauty! 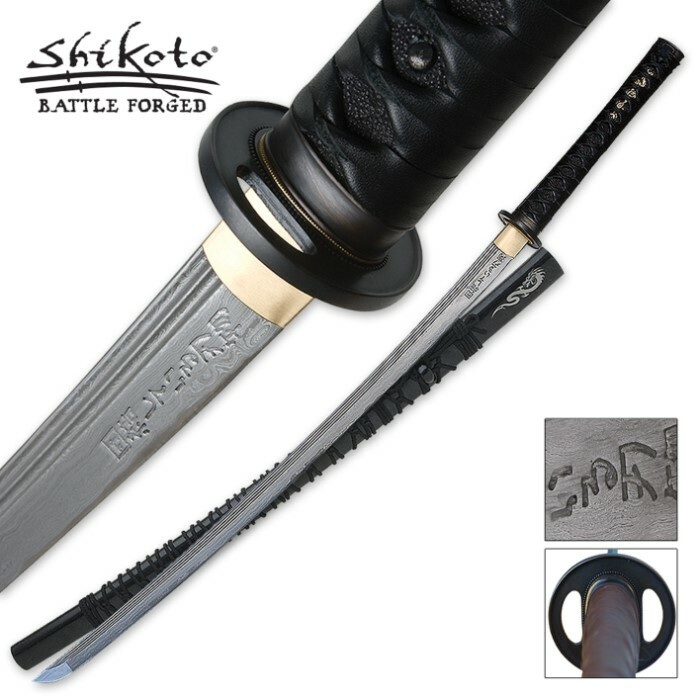 I was so impressed with this beautiful sword that I ordered the Tanto and the Wakizashi to have the whole set. Beautifully forged Damascus Steel is so sharp it slices paper under it's own weight. Nicely balanced with a full tang. The handle is well constructed and covered in Sting Ray skin and wrapped in high quality leather. I shopped around for a long time for just the right sword, until I found this one, and let me tell you from experience that this sword is easily worth three or four times the amount BudK is charging. To find something of comparable quality that is fully functional you can easily spend four to seven hundred dollars --or more! Don't hesitate or they will all be gone and you will kick yourself for not acting quickly! The Yoru Doragon Katana is a very excellent sword,it is as good or better than swords that will cost much more,the blade is strong and sharp,the handle is well made from a strong heavy wood,the tang is what surprised me it is Damascus,normally hard steel is used for tangs.Damascus steel takes a great deal of time and effort to produce,they don't waist it on tangs.Overall the Yoru Doragon Katana is by far the best sword I've seen in this price range. If you use your sword you must maintain and repair it like anything else. remember you do not sharpen a sword like you would sharpen a knife,take the time and do it right. Your friend Daniel of Nebraska. Blade is rather sharp. Not "razor sharp" by any means. And the steel is not nearly as folded as in the pictures. The habaki is marred on one side due to the saya not properly fitting. But otherwise, well balanced and a rather nice blade for the price. No complaints about this beautiful, but d****t I bought this just right before 1 penny shipping week I could've saved like 15 bucks. I wanted a Katana to match my Wakizashi and Tanto. This one is a perfect match. 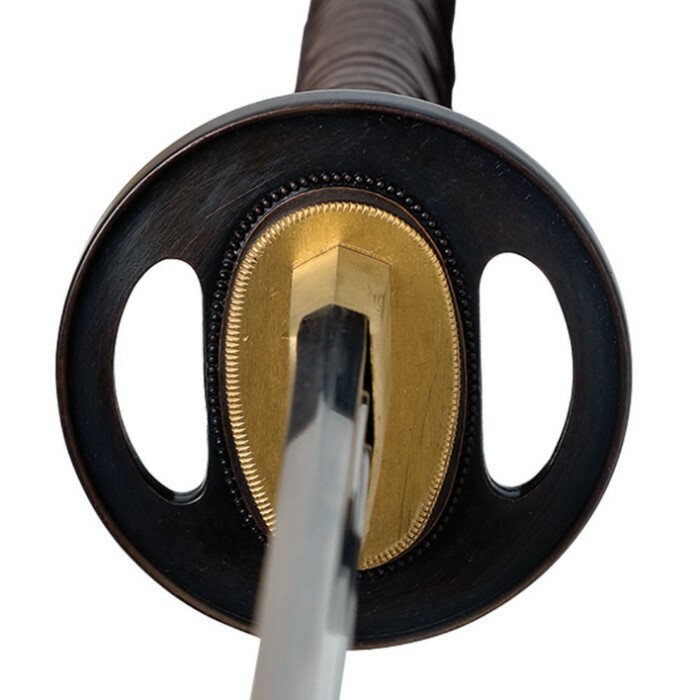 It's a beautiful blade with a simple but attractive Tsuba and fittings. I really like the leather wrapping on the handle. It gives a better feel than cotton to me. Balance is great and it feels very good in my hands. Mine has the gold dragon in the proper place for right handed edge up carry. The Minuki are properly placed for palm contact too. I am very pleased with it and highly recommend it to anyone who wants a quality sword at a reasonable price.